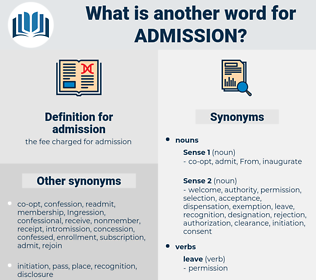 What is another word for admission? induction, assumption, accommodation, participation, attendance, denomination, designation, integration, observation, accreditation, inscription, addition, affiliation, schooling. intake, entry, acceptance, importation, entrance, entrances, Admitting. 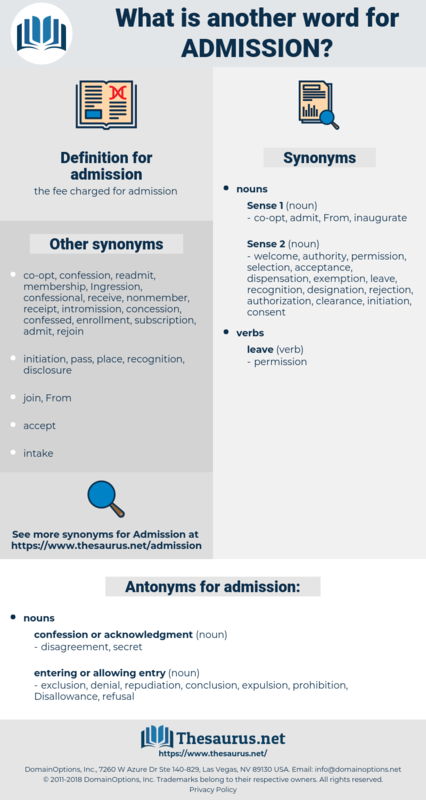 hospitalization, authorisation, hospitalisation, incorporation, adhesion, inclusion, Institutionalization, adoption, acknowledgment, intake, matriculation, appreciation, concession, qualification, placement, authorization, entry, acceptance, absorption, importation, entrance, adherence, sanction, Admitting, examination, permission, recruitment, internment, arrival, immigration, acceptability, endorsement, application, declaration. exclusion, denial, repudiation, conclusion, expulsion, prohibition, Disallowance, refusal. egress, discharge, ejection, removal, withdrawal, recantation, departure, Nonadmission, exit, dismissal, ouster, renouncement. It was rather a big admission, but she said nothing else, and it was Weston who broke the silence. In a tone that was admission, Mildred said: " I don't know." adenosine, adansonia, Atomism, Adonis Annua. entrance, entry, incoming, ingress, entering.